What a difference a day makes! 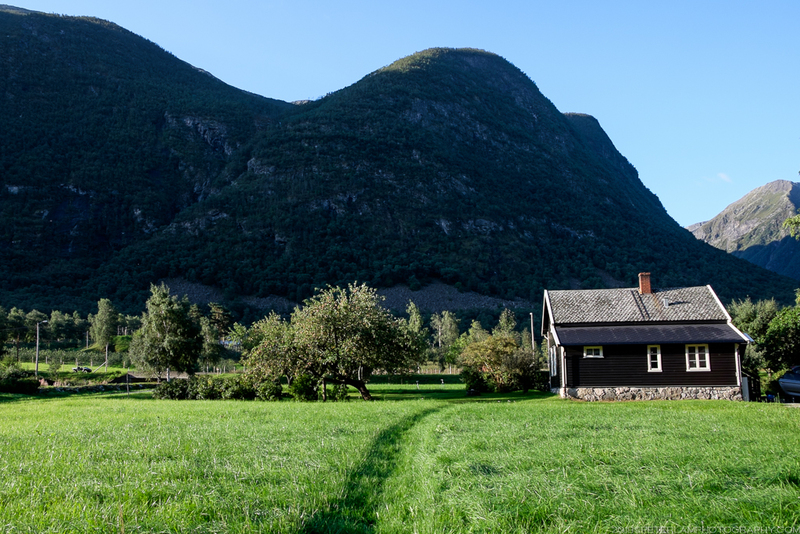 After a wet and gloomy drive from Bergen, we spend the night in a beautifully renovated farm house and awaken to sunshine and blue skies. 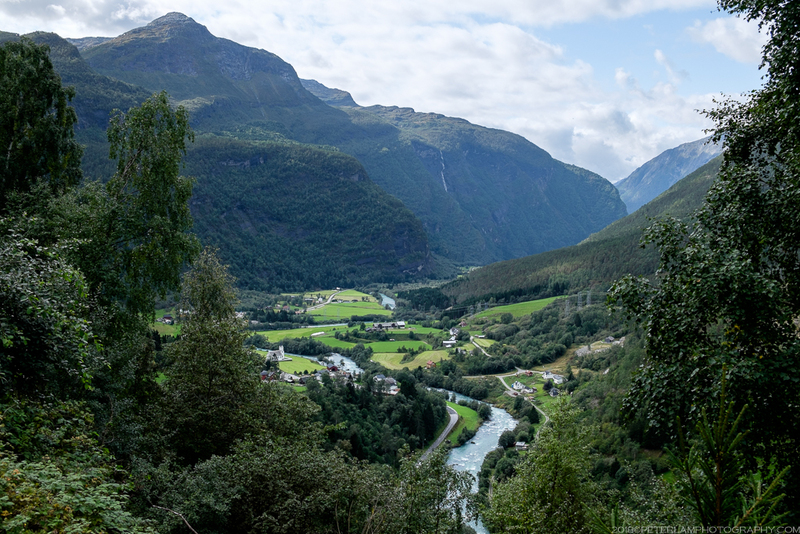 The lush and fertile valleys of Lærdal municipality are part of the south-eastern end of Sogn og Fjordane county (literally, Sogn and the Fjords), a predominantly agricultural area in Western Norway. 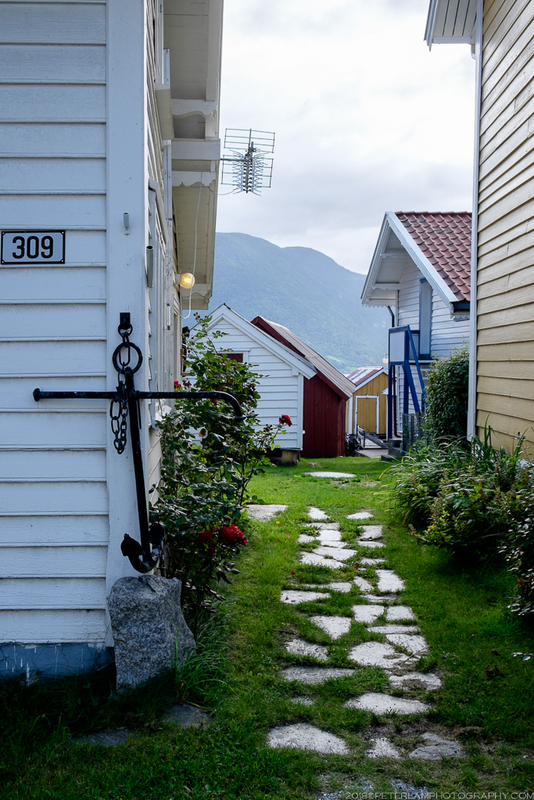 We would spend the day touring parts of this region before heading into the highlands in neighbouring Oppland county. 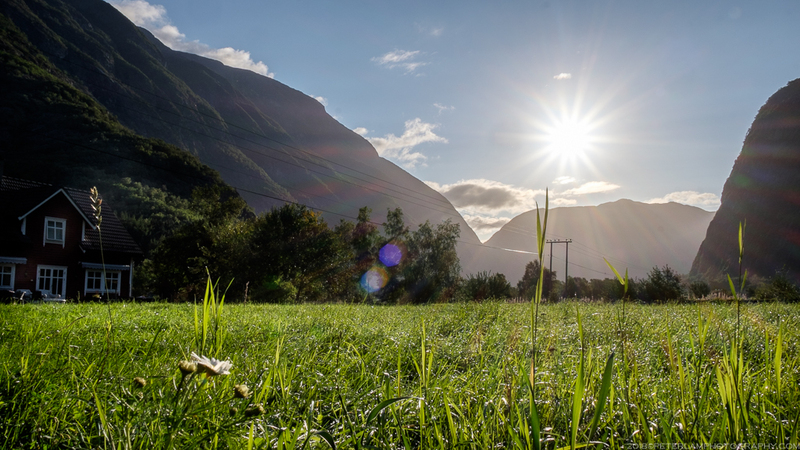 Rise and shine in beautiful Lærdal valley. 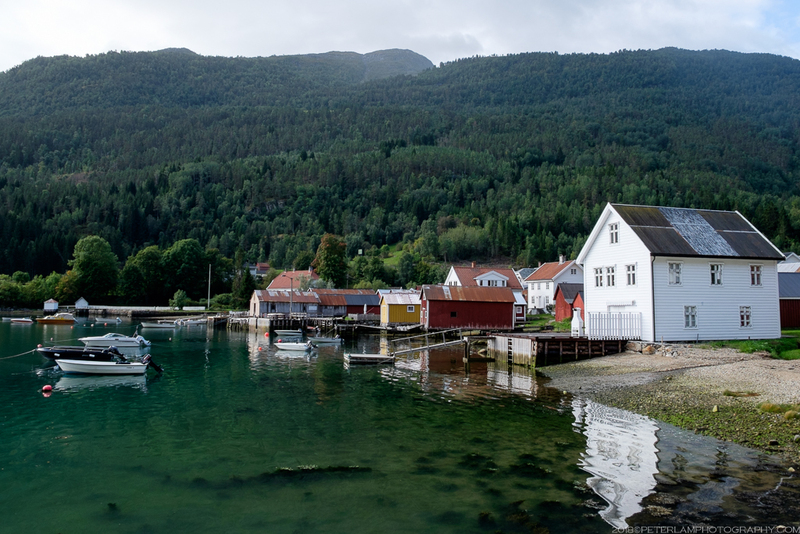 Sogn og Fjordane is mainly a rural area with a scattered population, and driving here is a true pleasure. 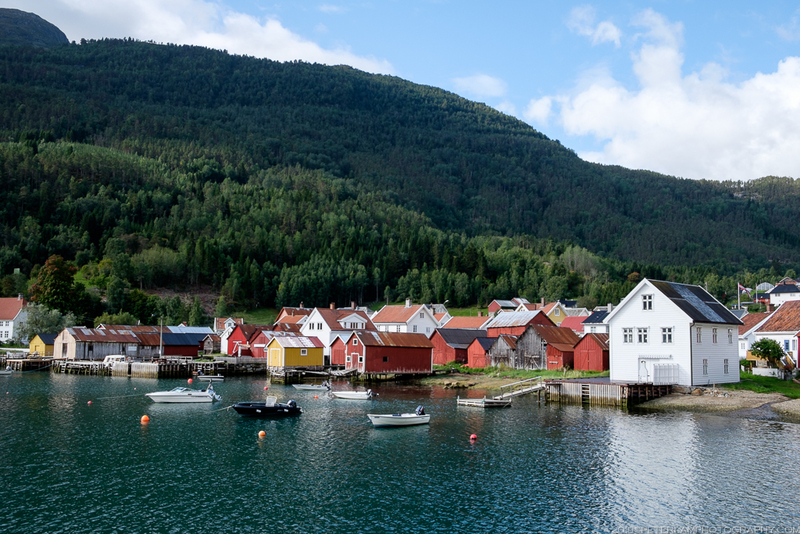 Home to the Sognefjord (Norway’s largest and deepest, nicknamed the King of Fjords), the county is a popular cruise ship destination due to the deep blue waters and steep mountain vistas. The views are especially dramatic as you travel further inland towards higher mountain ranges. A renovated farmhouse was our AirBnB accommodations the previous night. 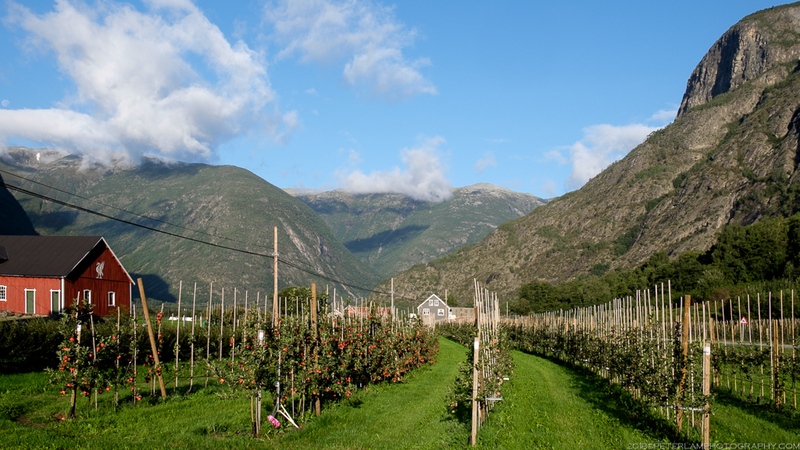 Farm orchards in lush Lærdal valley. 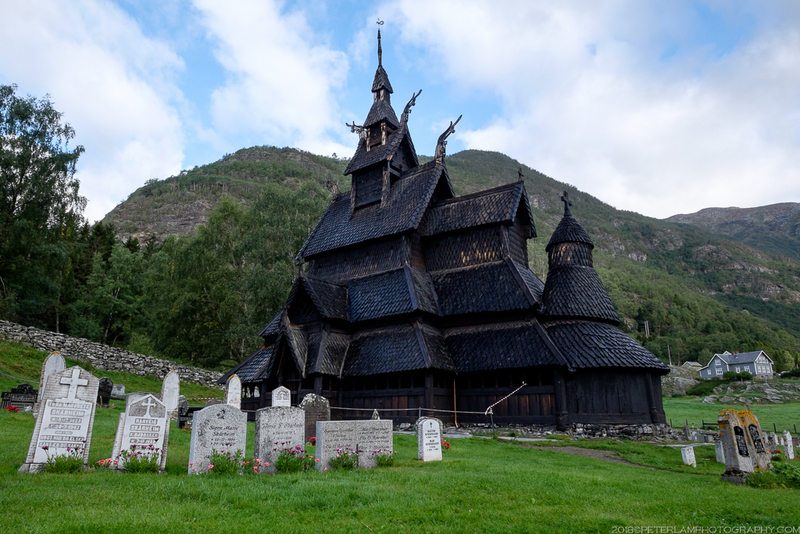 The three-tiered Borgund Stave Church (Borgund stavkyrkje) located in the village of Borgund is an impressive structure. Stave churches are characterized by the “staves” (thick wooden posts) that hold them up, and are expertly constructed using nothing more than joints and joins. Set against an idyllic backdrop, the unique combination of austere Christian architecture with striking pagan elements is characteristically Nordic. 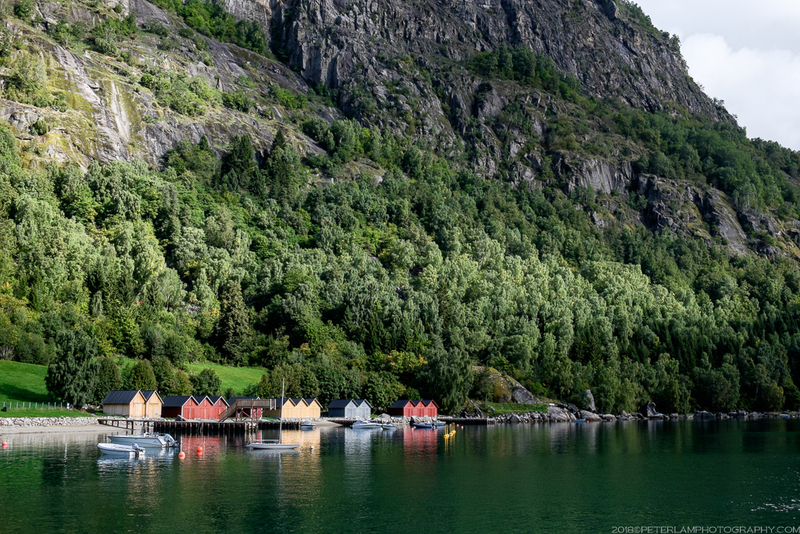 Here in the land of Vikings, dragons and saints go hand in hand. 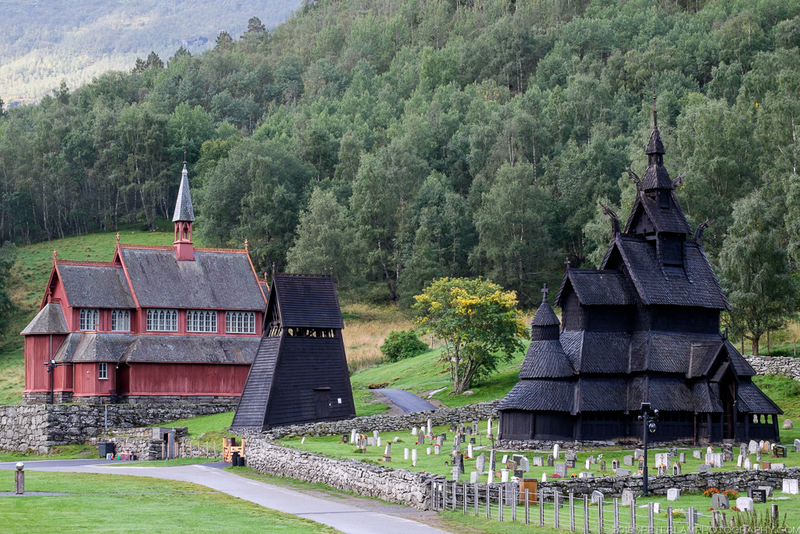 The stave church (now a museum) and its successor, Borgund Church, behind. 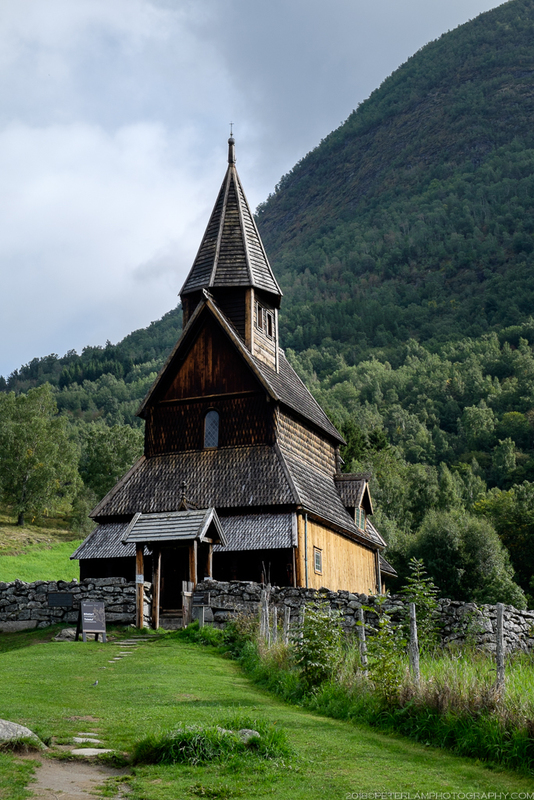 Crossing the to the northern shore of the Sognefjord from Fodnes to Mannheller, we stop at the village of Kaupanger to see the largest stave church in the county. 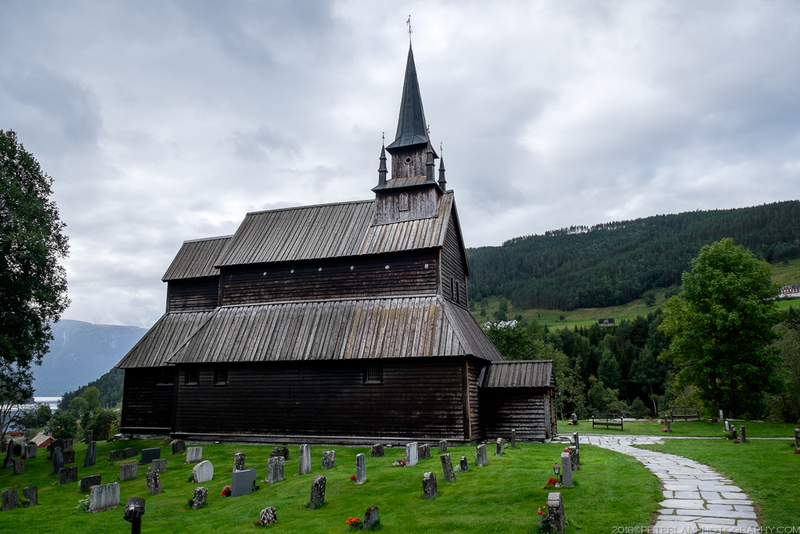 The Kaupanger Stave Church (Kaupanger stavkyrkje) is a Norwegian Cultural Heritage Site, and has continuously served as a parish church since its construction in the mid-12th century. 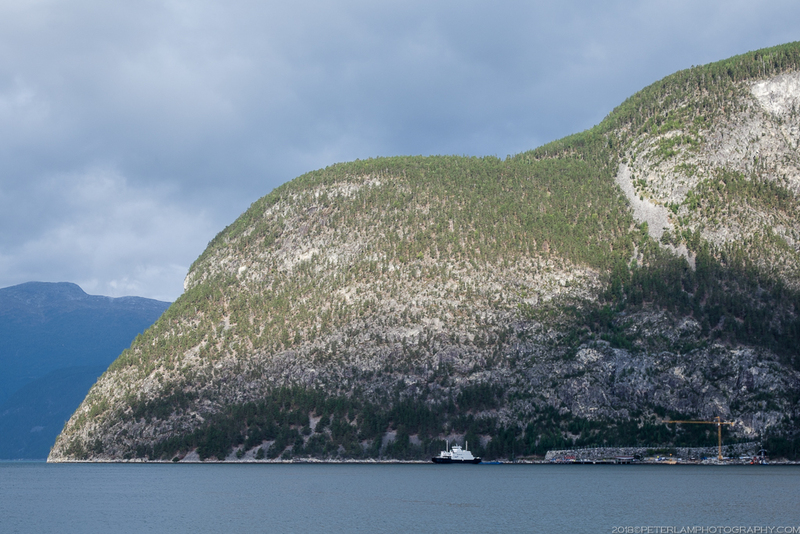 …across the Sognefjord to Mannheller. 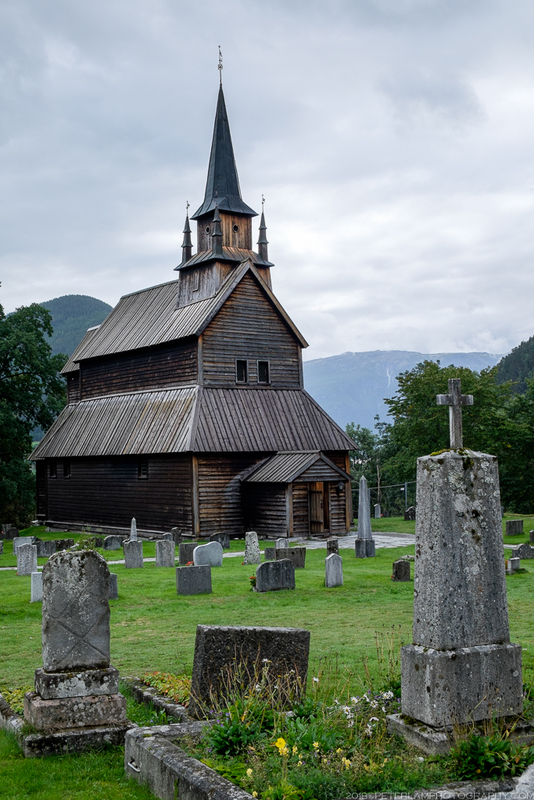 This is the largest stave church in Sogn og Fjordane county. 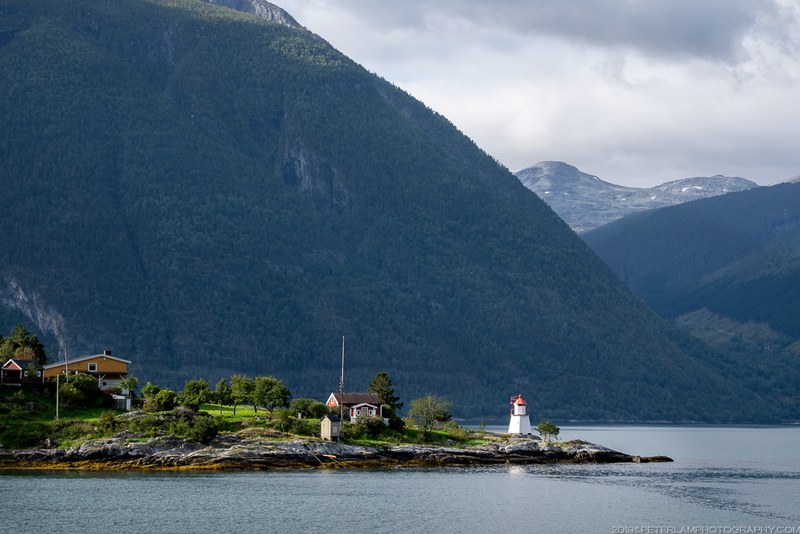 Tracing a northbound route, we arrive at the village of Solvorn located on the western shore of Lustrafjorden, the innermost arm of Sognefjorden. 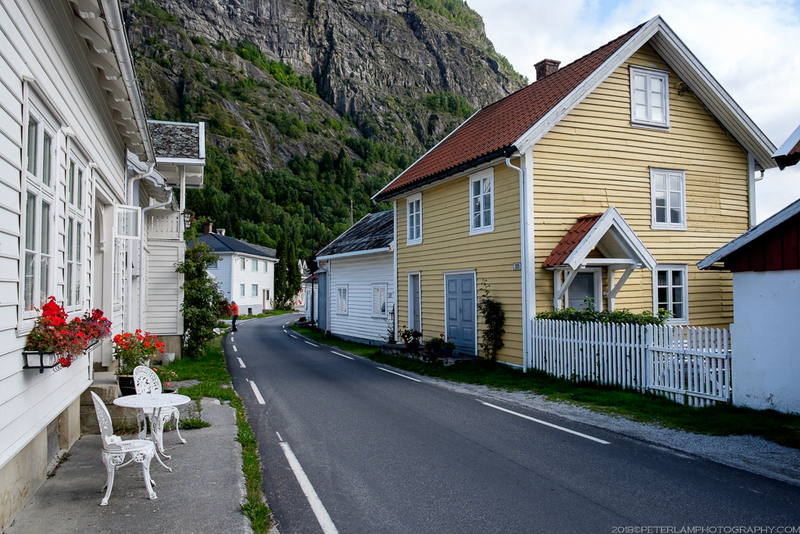 It sits directly across the village of Ornes, and while we wait for the ferry (one of the smallest – and priciest – drive-on ferries on our trip), we explore its picturesque streets. The houses are immaculately maintained, but there are no residents to be seen? 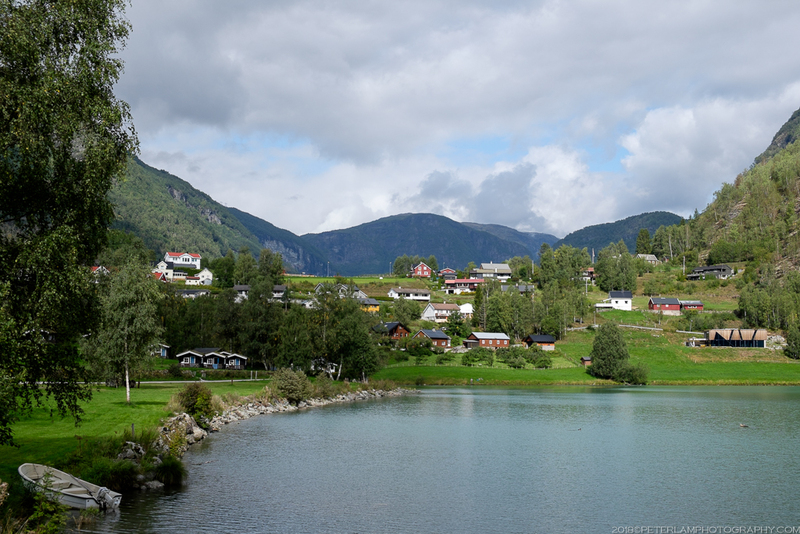 The quiet village of Solvorn. Everything is so pretty, but where is everyone? 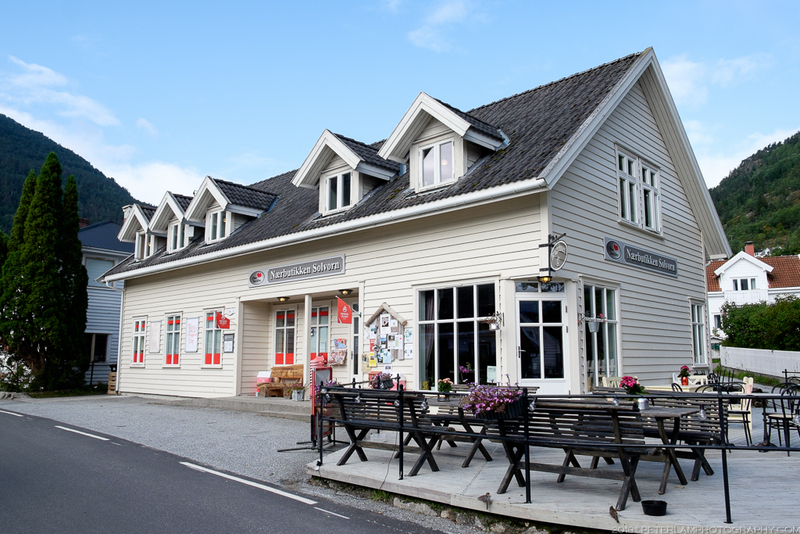 The main store near the harbour. Perfectly maintained buildings and gardens. 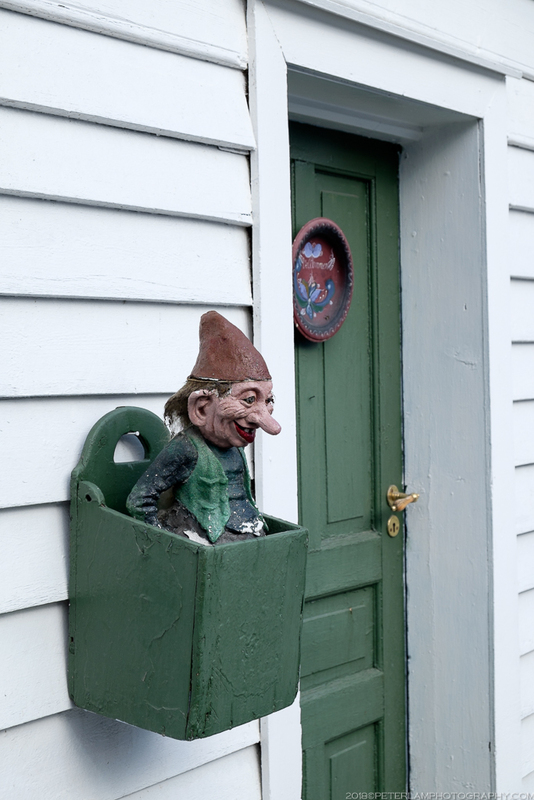 The Norwegian obsession with trolls and gnomes runs deep! 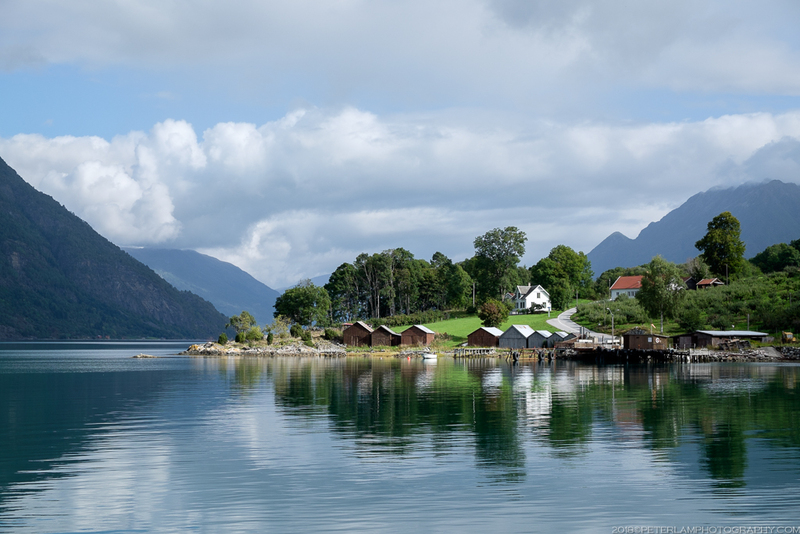 Another view of Solvorn harbour. Colourful boat shacks line the shore. Leaving Solvorn on a small car ferry. 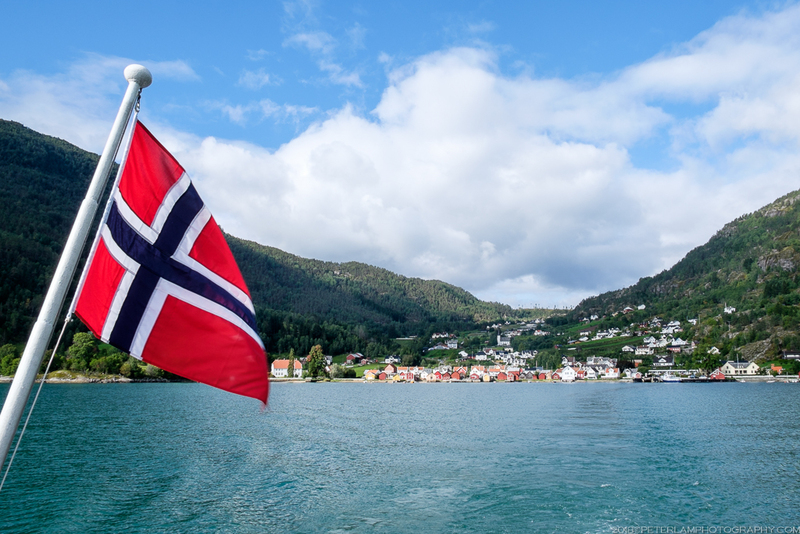 The ferry crossing takes just a few minutes and soon we arrive on the eastern shore of Lustrafjorden in Ornes, and the location of Urnes Stave Church (Urnes stavkyrkje). Built around 1130, it is the oldest of its kind in the world and has been designated a UNESCO World Heritage Site. Arriving at the village of Ornes. 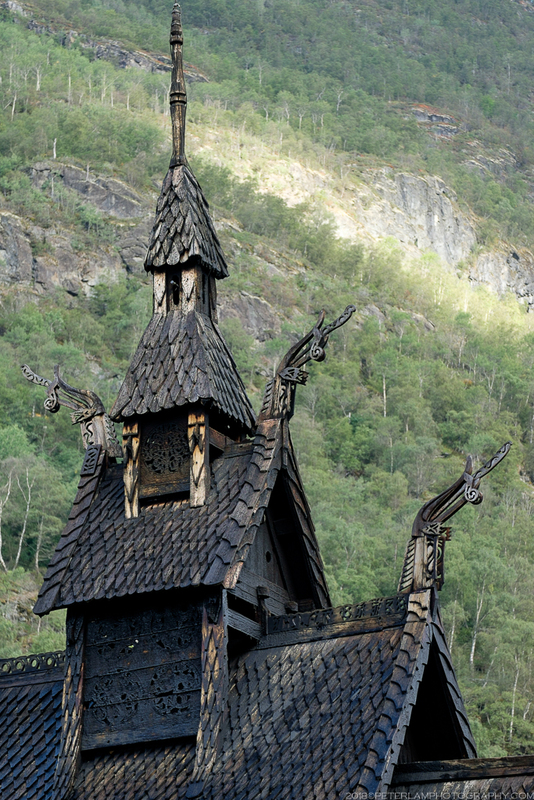 Urnes Stave Church, a UNESCO World Heritage Site. 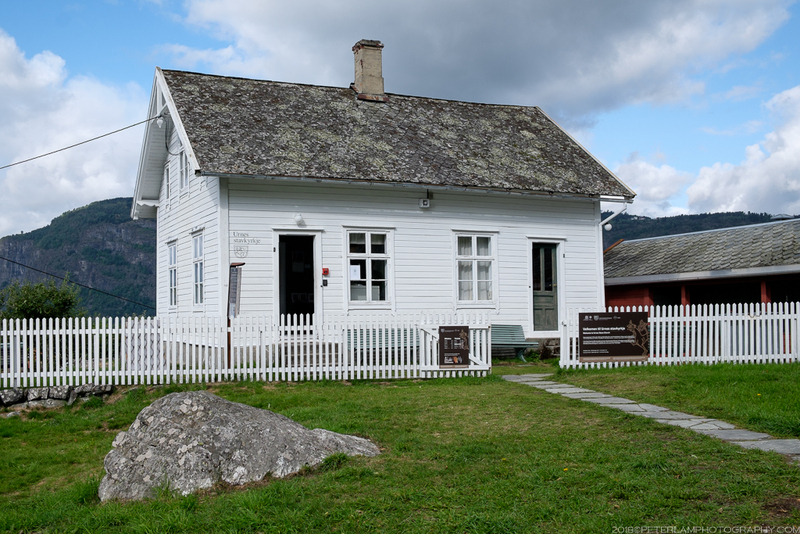 The visitor center at Urnes. 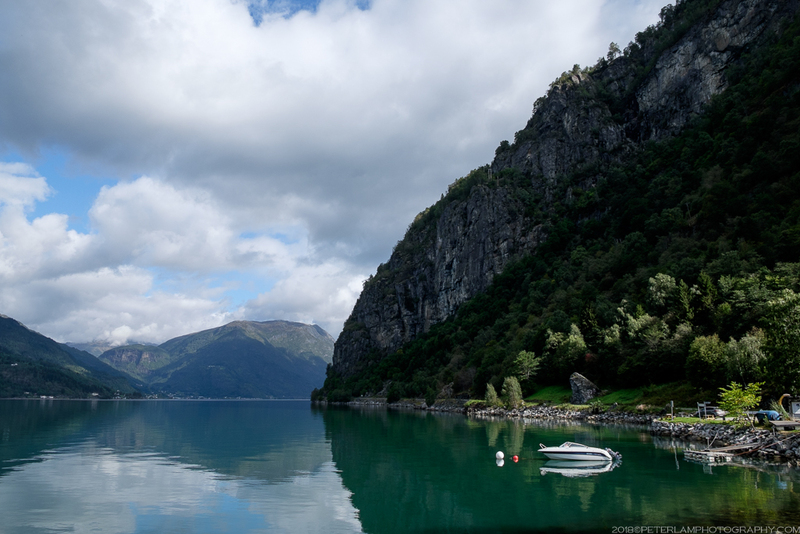 Following the eastern shore of Lustrafjorden, we head further north on a leisurely and scenic drive, stopping for a lunch break near Feigumfossen falls. 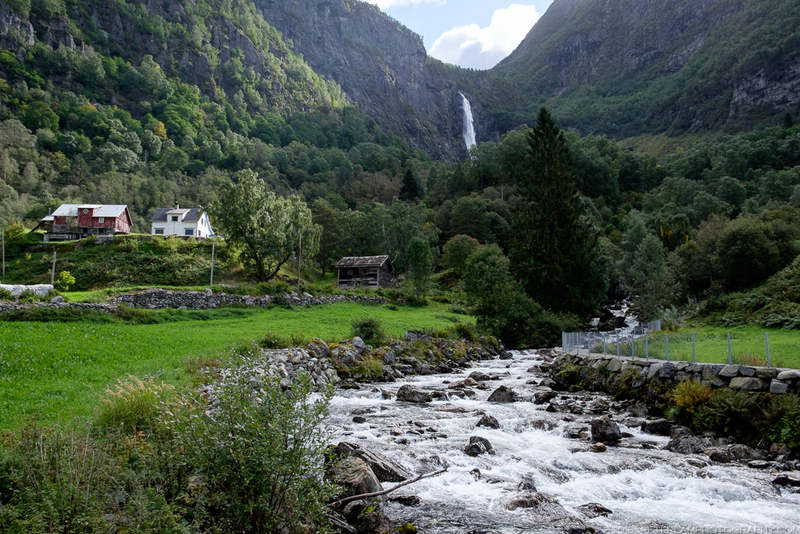 As we head towards the town of Skjolden, the landscape begins to subtly change. 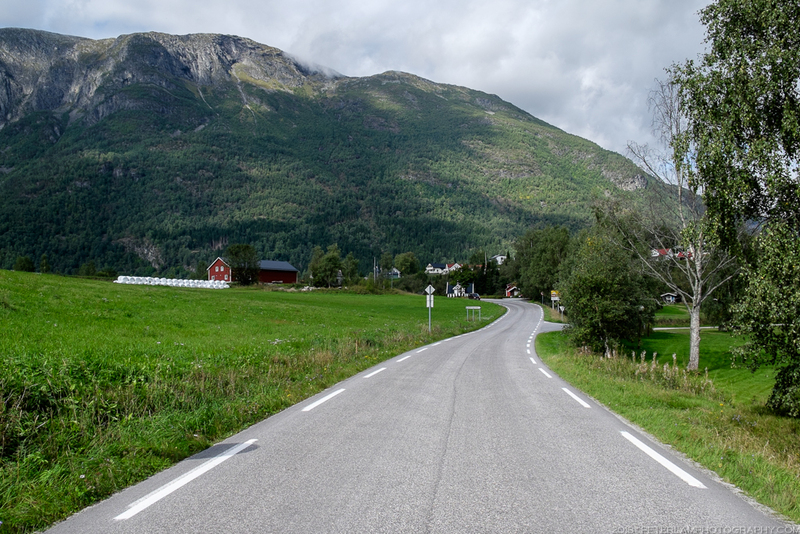 The mountains get taller, the valleys more dramatic, and we would soon be leaving the fertile hills of Sogn og Fjordane and head into the Norwegian highlands – and the highest mountain pass in Northern Europe, Sognefjellet. 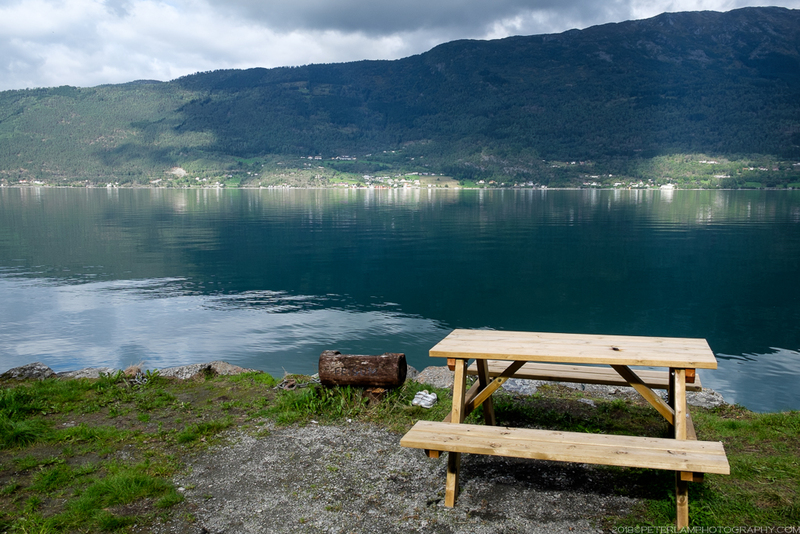 Lunch break on the eastern shore of Lustrafjorden. 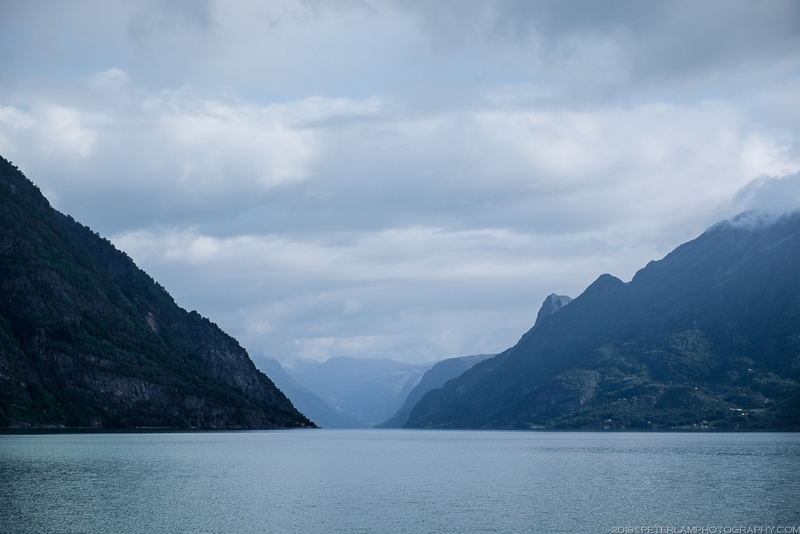 Perfectly calm water on the fjord today. Near the town of Skjolden. Eidsvatnet lake, approaching the highlands. 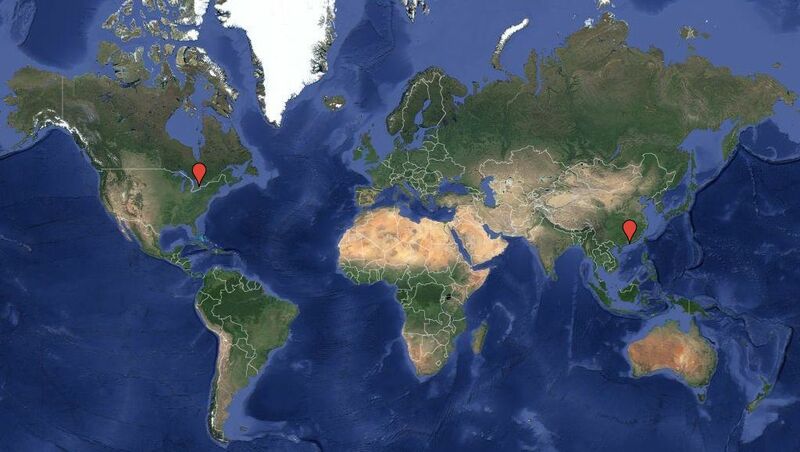 These roads are a driver’s dream! 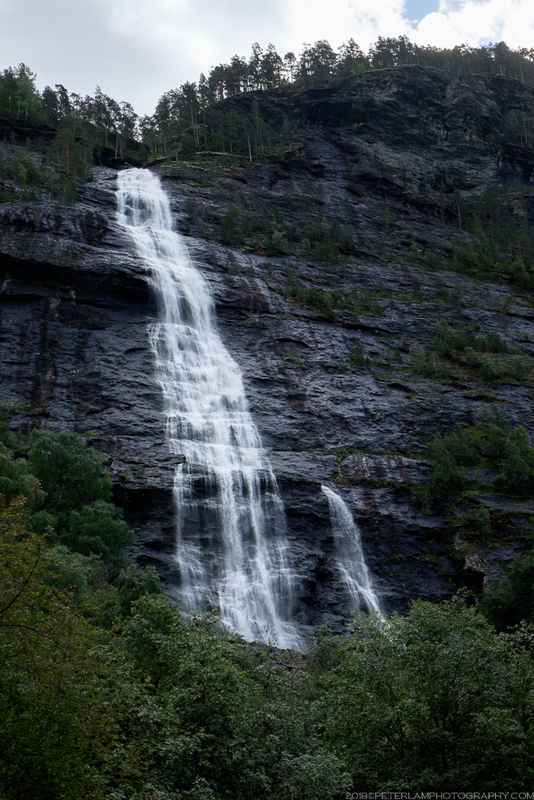 One of the many waterfalls on the route. 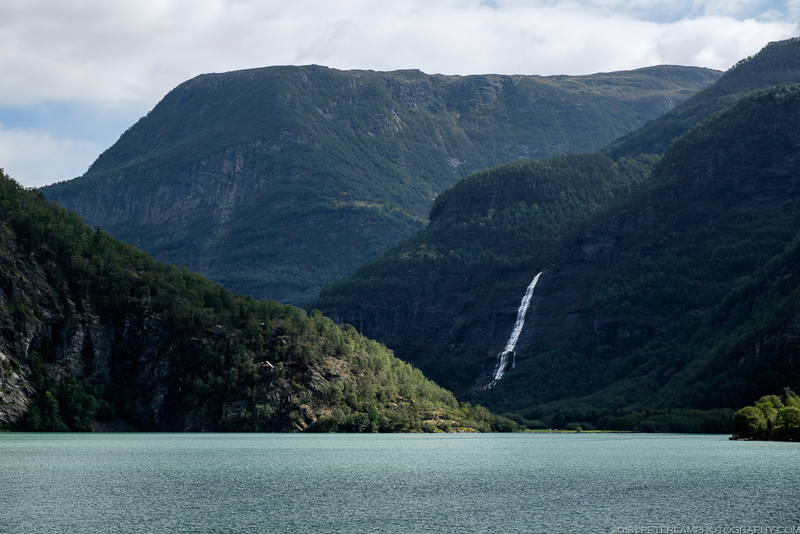 Leaving Sogn og Fjordane, the landscape becomes more dramatic as we climb ever higher.